On June 9, 1650, the Great and General Court of Massachusetts approved Harvard President Henry Dunster’s charter of incorporation. 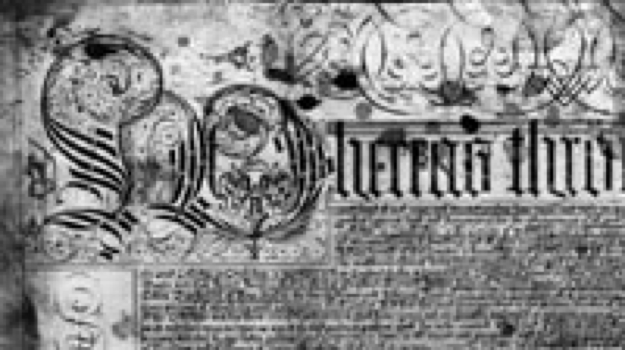 The Charter of 1650 established the President and Fellows of Harvard College (a.k.a the Harvard Corporation), a seven-member board that is the oldest corporation in the Western Hemisphere. Harvard College was established in 1636 by vote of the Great and General Court of the Massachusetts Bay Colony and was named for its first benefactor, John Harvard of Charlestown, a young minister who, upon his death in 1638, left his library and half his estate to the new institution. Harvard’s first scholarship fund was created in 1643 with a gift from Ann Radcliffe, Lady Mowlson. On Sept. 8, 1836, at Harvard’s Bicentennial celebration, it was announced that President Josiah Quincy had found the first rough sketch of the College arms – a shield with the Latin motto « VERITAS » (« Verity » or « Truth ») on three books – while researching his History of Harvard University in the College Archives. During the Bicentennial, a white banner atop a large tent in the Yard publicly displayed this design for the first time. 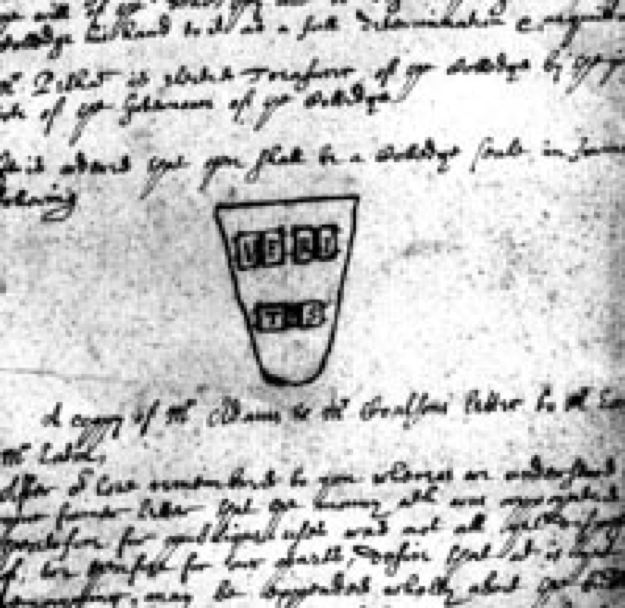 Until Quincy’s discovery, the hand-drawn sketch (from records of an Overseers meeting on Jan. 6, 1644) had been filed away and forgotten. It became the basis of the seal officially adopted by the Corporation in 1843 and still informs the version used today. The 1708 election of John Leverett, the first president who was not also a clergyman, marked a turning of the College toward intellectual independence from Puritanism. 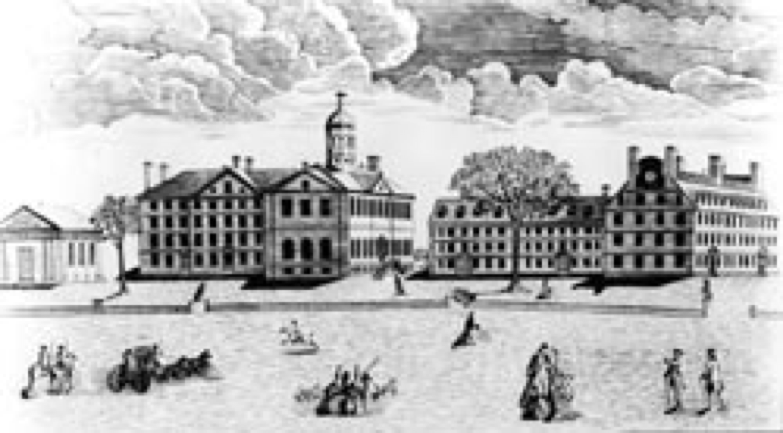 As the College grew in the 18th and 19th centuries, the curriculum was broadened, particularly in the sciences, and the College produced or attracted a long list of famous scholars, including Henry Wadsworth Longfellow, James Russell Lowell, William James, the elder Oliver Wendell Holmes, Louis Agassiz, and Gertrude Stein. Charles W. Eliot, who served as president from 1869 to 1909, transformed the relatively small provincial institution into a modern university. During his tenure, the Law and Medical schools were revitalized, and the graduate schools of Business, Dental Medicine, and Arts and Sciences were established. Enrollment rose from 1,000 to 3,000 students, the faculty grew from 49 to 278, and the endowment increased from $2.3 million to $22.5 million. It was under Eliot’s watch that Radcliffe College was established. In the 1870s a group of women closely linked to Harvard faculty were exploring ways to make higher education more accessible to women. One of this group, Stella S. Gilman, was married to historian and educator Arthur Gilman. In 1878, at the urging of his wife, Gilman proposed the foundation of a college for women to President Eliot. Eliot approved, and seven women were chosen to design the new institution. Among them were Stella Gilman, Alice Mary « Grave Alice » Longfellow, a daughter of the famous poet, and Elizabeth Cary Agassiz, the widow of renowned naturalist Louis Agassiz. In 1879, the « Harvard Annex » for women’s instruction by Harvard faculty began operations. And in 1894 the Annex was chartered by the Commonwealth of Massachusetts as Radcliffe College, with Elizabeth Cary Agassiz as its first president. Under Harvard President A. Lawrence Lowell (1909-33), the undergraduate course of study was redesigned to ensure students a liberal education through concentration in a single field with distribution of course requirements among other disciplines. Today, 51 fields of concentration are offered to Harvard College students. The tutorial system, also introduced by Lowell and still a distinctive feature of a Harvard education, offers undergraduates informal specialized instruction in their fields. One of Lowell’s most significant accomplishments was the House Plan, which provides undergraduates with a small-college atmosphere within the larger university. After being housed in or near Harvard Yard during freshman year, students go to one of 12 Houses in which to live for the remainder of their undergraduate careers. (A 13th House is designed for nonresident students.) Each House has a resident master and a staff of tutors, as well as a dining hall and library, and maintains an active schedule of athletic, social, and cultural events. Recent presidents James Bryant Conant, Nathan M. Pusey, Derek Bok, Neil L. Rudenstine and Lawrence H. Summers each made significant contributions toward strengthening the quality of undergraduate and graduate education at Harvard while, at the same time, maintaining the University’s role as a preeminent research institution. Conant (1933-53) introduced a system of ad hoc committees from outside the University to evaluate tenure candidates being considered for faculty positions. Conant also initiated the General Education Program to give undergraduates breadth in fields outside their major study. And it was under Conant, in 1943, that Harvard and Radcliffe signed an agreement allowing women students into Harvard classrooms for the first time. Under Pusey (1953-71), Harvard undertook what was then the largest fundraising campaign in the history of American higher education, the $82.5 million Program for Harvard College. The Program strengthened faculty salaries, broadened student aid, created new professorships, and expanded Harvard’s physical facilities. A similar but greatly expanded fundraising effort, the Harvard Campaign (1979-84), was conducted under the leadership of Derek Bok (1971-91) and raised $356 million by the end of 1984. Some of the important educational initiatives Bok undertook include: reform of the undergraduate course of study through the innovative Core Curriculum, the introduction of graduate programs crossing traditional borders of professional disciplines, new approaches to the training of lawyers and doctors, and a renewed emphasis on the quality of teaching and learning at all levels. A 1977 agreement delegated responsibility for the education of undergraduate women to the College. Rudenstine, Harvard’s 26th president, served from 1991-2001. As part of an overall effort to achieve greater coordination among the University’s schools and faculties, Rudenstine set in motion an intensive process of University-wide academic planning, intended to identify some of Harvard’s main intellectual and programmatic priorities. In 1999, he announced the launch of a major new venture in interdisciplinary learning, the Radcliffe Institute of Advanced Study, created through the merger of Radcliffe College with Harvard. During his tenure Rudenstine worked to sustain and build federal support for university-based research. Under his leadership, Harvard’s federally sponsored research grew to a projected $320 million in 2000, up from $200 million in 1991. Rudenstine also stressed the University’s commitment to excellence in undergraduate education, the importance of keeping Harvard’s doors open to students from across the economic spectrum, the task of adapting the research university to an era of rapid information growth, and the challenge of living together in a diverse community committed to freedom of expression. Summers served as Harvard’s 27th president from 2001-2006. He is now the Charles W. Eliot University Professor. An eminent scholar and admired public servant, Summers served in a series of senior public policy positions, most notably as secretary of the treasury of the United States. During his presidency, Summers focused on laying the foundations for renewal that will be necessary to sustain Harvard’s excellence into the 21st century and beyond. Under his leadership, the University made numerous changes directed at providing the best educational experience for students across the University. His ambitious plans also encompassed significant growth in the faculties, the further internationalization of the Harvard experience, expanded efforts in and enhanced commitment to the sciences, and support for the humanities and the arts. Summers also spearheaded the effort to ensure that Harvard attract the strongest students regardless of financial circumstances. Dr Summers spoke to the Harvard Club of France on 9th March 2012. Derek Bok returned to the president’s office as interim president in July 2006 and served until new President Drew Faust took over July 1, 2007.